In general, bowling is not a game that translates well into the world of video games. I would guess that most gamers could count the number of entertaining bowling games across all platforms on one hand. 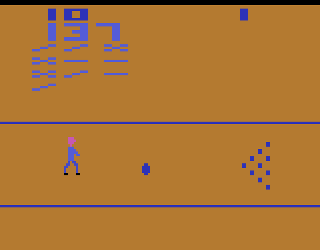 It is therefore surprising, especially considering the fact that most sports games on the Atari VCS are horrible, that Bowling is a good game. You move your bowler back and forth across the floor to decide where to release the ball. Once the ball is heading down the lane you can apply spin to make the ball curve one way or another, but once you apply spin in one direction you can neither stop it nor bring it back the other way, which adds an element of realism to the game. The game keeps proper score and even displays your entire scorecard throughout the game. Once your game is over, your final score stays on the screen until you hit the reset switch to play again. It only takes about 3 minutes to complete a game (less if you throw a lot of strikes), and this quick pace makes you want to keep playing just one more time to try and best your score. It even supports 2 players so you can play against a friend. The graphics are pretty standard for an older, first party 2600 game, but the player model looks better than a lot of things I’ve seen on the system. Your lane is viewed from overhead while the bowler himself is viewed from the side, creating an odd perspective that must be forgiven on a console of this age. The sound effects are amusing, as the sound of the rolling ball seems more like a boulder rolling down a mountain, and the falling pins remind me of a space shooter. These are the things you come to expect when playing VCS games however, and they are part of what gives the games their charm. Buy Bowling on GameGavel or Amazon. Tagged 2600, Atari, Bowling, Review, Sports, VCS. Bookmark the permalink.